Hey all and happy Wednesday!! The weather is FINALLY warming up… thank goodness! It was in the 50’s and almost 60’s this week, so shooting has finally been easier, especially since the wind has died down a bit. 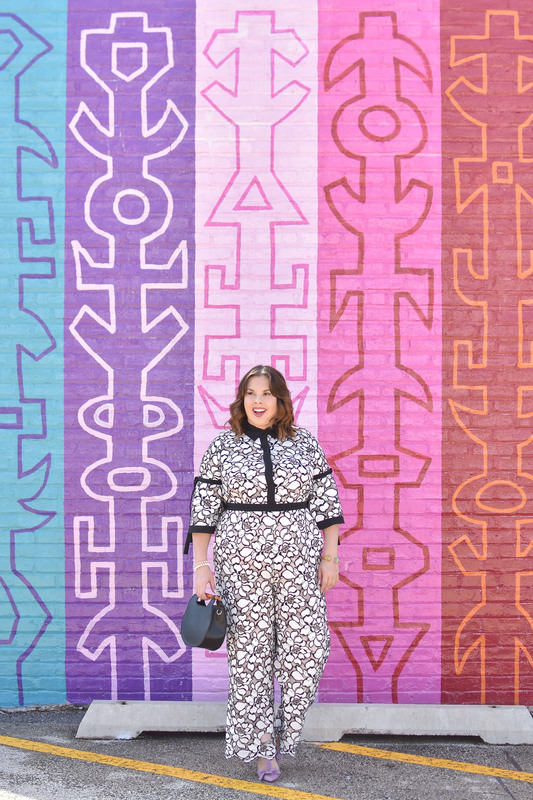 I saw this jumpsuit on a recent visit to Eloquii, and was in love. To be honest, I bypassed it the first time and then circled back to it later! I loved the floral lace detailing on it, but I also loved the black detailing on it as well. 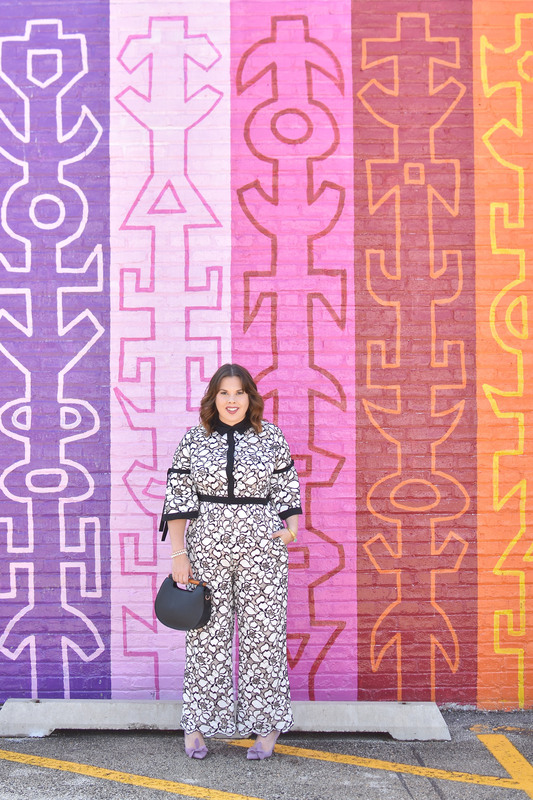 I love a good jumpsuit now, but sometimes (most of the time) it is too long and I have an issue wearing it with heels, as it it still too long. Thankfully, this one was the perfect length and that black waist detailing just hit at the perfect spot! An all over print can sometimes be a bit overwhelming, but I have been trying to take more risks with prints, especially an all-over one. 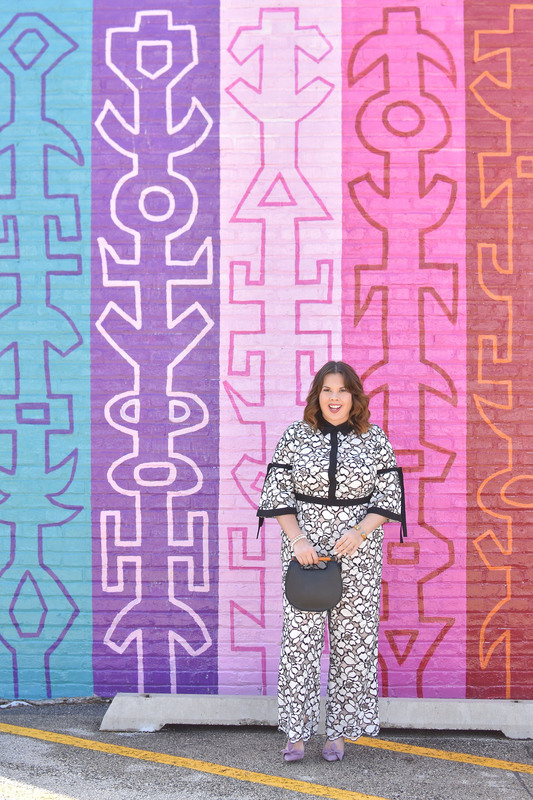 I love finding fun, bold, or even vibrant prints to wear for different occasions! I wore this to Easter (I am Greek Orthodox) this past weekend and it was quite the hit! It’s a bit over the top, but I loved it. 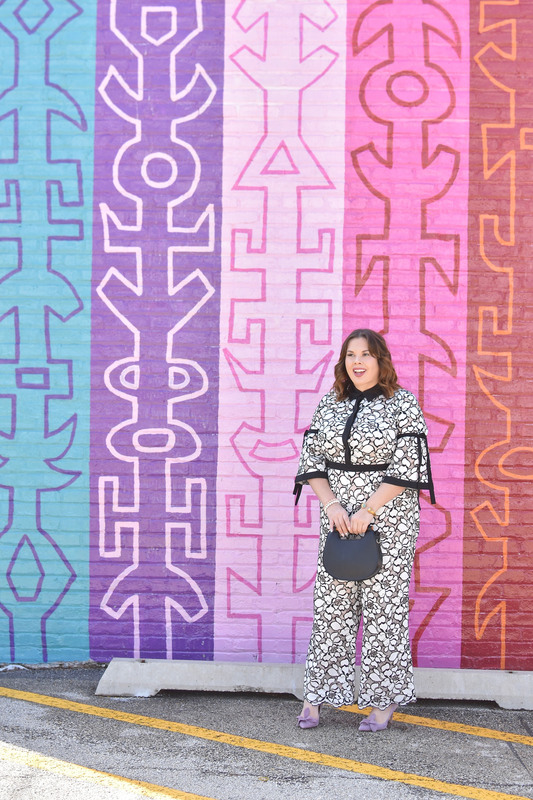 I wore this with this light purple shoe, so obviously had to find a fun wall to play off of the shoes! I also loved this fun little purse with it as well, it was such a cute accessory, and definitely a bit different than one of my usual giant bags! Have a wonderful Wednesday and week! loving this floral lace jumpsuit on you babe. it’s so chic and perf for spring! Oh this is so cute! I am really loving the lace and all of the detail! I would so rock this for Spring! What a great jumpsuit! I love those sleeves on it! I like how you added a pop of color with your shoes! This is such a gorgeous jumpsuit babe! love the print. WOW wow wow I think this is my favorite outfit from you! What a fantastic jumpsuit! 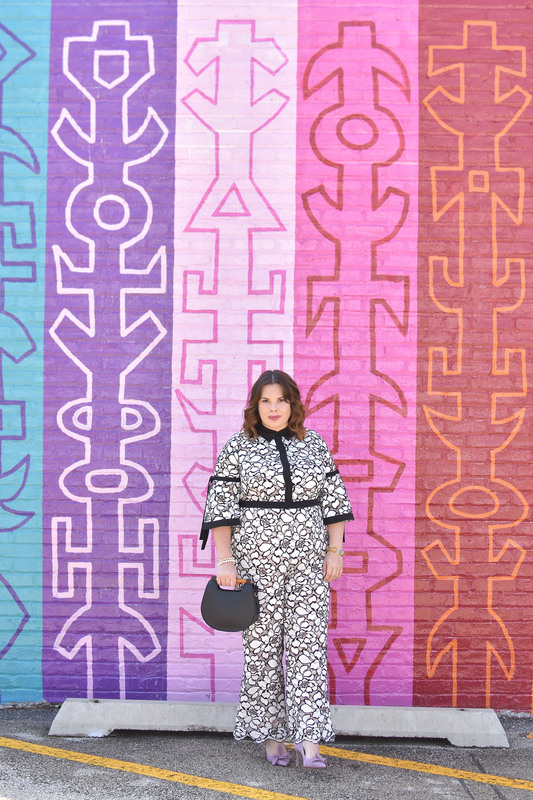 This is such a gorgeous jumpsuit Denise! you look stunning! this outfit looks gorgeous on you. The details of this jumpsuit is phenomenal ! 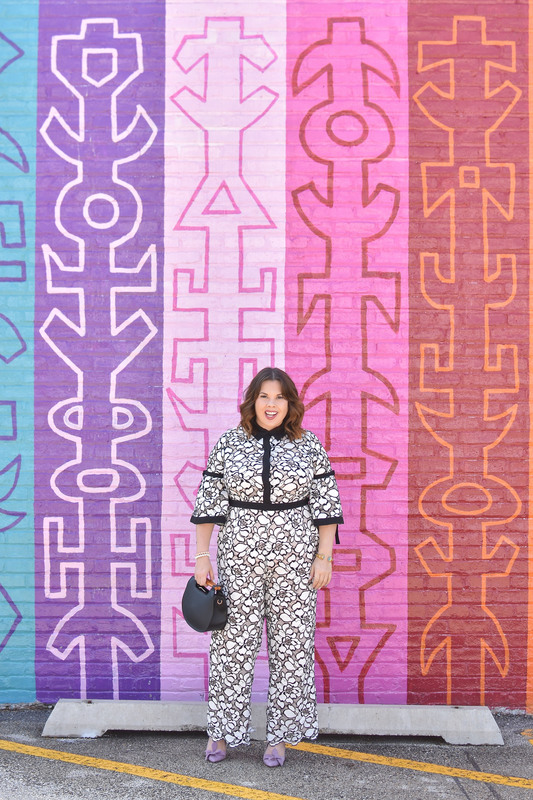 This jump-suit is fabulous on you! I love the print and I can definitely get on board with those pastel purple pumps! You look FABULOUS. I LOVE THIS!